Here you'll find some lovely ideas for Mother's Day presents for you to consider for your mother, wife, grandmother, sister, or friend. This is my very first Mother's Day without my darling mother, so I'm finding it a little bit challenging. But, I've decided to treat some of the other ladies in my life who mean a lot to me. Have you ever tasted panna cotta? It's so creamy and smooth you just can't help but roll your tongue around the flavor. Panna Cotta stands for "cooked cream," so you can imagine how yummy this Mother's Day recipe will be. In a medium saucepan over low heat, stir together the cream, sugar, chocolate, and vanilla until completely melted and smooth. In a small bowl place the boiling water and then sprinkle the gelatin over it and stir until it's dissolved. Stir the dissolved gelatin into the chocolate mixture thoroughly. Pour 1/2 cup of chocolate mixture into espresso cups, ramekins, or (my favorite) pretty tea cups and chill for about 4 hours or until completely set. 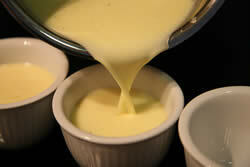 Prepare the sauce for topping by simmering the fruit, sugar, and orange juice in a saucepan for 3-5 minutes. You can use frozen berries if you prefer, just be sure to simmer until berries are soft. Chill the sauce until ready to serve. Spoon a bit of the berry fruit sauce on top of each white chocolate panna cotta before serving. Here are a few good ideas for Mother's Day presents that you can modify to suit your own lady's favorite likes and tastes. I think any one of these Mother's Day gifts would make your mom feel loved. Chocolate Covered Coffee Beans In A Teacup - Buy a really pretty teacup and saucer (or if you're mom's the "mug type" go for that). 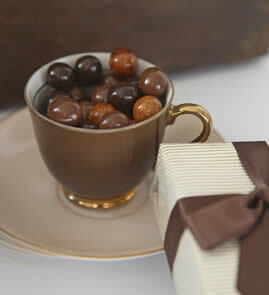 Fill the cup to the brim with delicious chocolate covered coffee or espresso beans. Wrap the whole thing in a sheet of cellophane and tie with a pretty ribbon. This is a really flexible idea because if your mother doesn't like coffee, you can fill the cup with her own favorite chocolate candy, selection of herbal teas, or something else you know she'll love. Chocolate Covered Strawberries - My brother used to treat my mother to some really gourmet chocolate covered strawberries for Mother's Day. They were incredible! 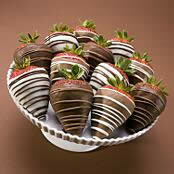 You can order some gourmet strawberries, like those in the photo, for your mom at Shari's Berries. Don't they look fantastic? But, if you can get your hands on some fresh strawberries, it's a cinch to make your own chocolate covered strawberries. Melt your chocolate in a double boiler or in the microwave. Melt contrasting colors so you can drizzle over the strawberries to really make them look fancy. Hold the strawberry by the stem and roll it around in the chocolate allowing the excess to drip off. If you'd like to add some pizazz, you can also roll the dipped strawberries in chopped nuts or coconut before placing them on a piece of waxed paper to set. Place the contrasting color melted chocolate in a plastic baggie, snip off the corner and drizzle across the strawberries as desired. Magazine Subscription - Although it's not necessarily chocolate related, I'm a big fan of magazine subscriptions as Mother's Day gifts. You could certainly get something yummy like "Cooking With Paula Deen" or "Every Day With Rachael Ray." 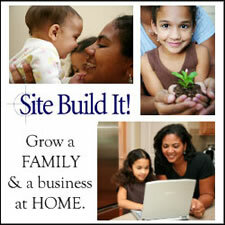 But if your lady is more comfortable in the garden or golf course than the kitchen, there are magazines for her too. Magazines.com offers subscriptions to all of the most popular magazines in dozens of categories. When you give a magazine subscription, you give a gift that can be enjoyed all year round. 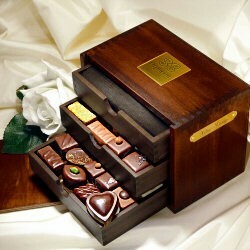 Gourmet Chocolate Gift - Traditional boxed chocolate has long been a favorite of mothers around the world. You can step it up a notch and treat the greatest lady in your life to some top-of-the-line gourmet chocolates from zChocolat.com . These are the classiest chocolate gifts I've ever seen when it comes to your traditional boxed chocolates. Just look at the fine wooden cases that house these delicious morsels. It's a not-to-be-forgotten gift! I hope you enjoyed this issue of Charmingly Chocolate with the creamy and delicious White Chocolate Panna Cotta recipe and the gift ideas for Mother's Day. If you have any feedback or comments you'd like to share with me, just reply to this zine and let me know. And don't forget to show off your panna cotta.